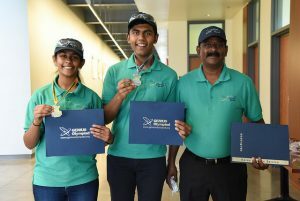 RICHLAND, Wash. – High school students in the Tri-Cities have seen success not only at the state level in science fairs, but also at national and international competitions after collaborating with researchers at Washington State University Tri-Cities for their research projects. The goal of the partnerships, the professors said, is not only to provide students with exposure to a variety of science and engineering projects that can stand to have large impacts, but additionally so that more students will receive exposure to hands-on opportunities in the science, technology, engineering and mathematics (STEM) fields. With this experience, the students can witness what is possible through those career paths, they said.